Over the last few years, customised furniture has become more popular for several reasons. But one of the main reasons is that customised furniture is more affordable for the average consumer. In addition, furniture buyers are recognizing the many aesthetic and economic benefits. One of the top bespoke pieces is dining chair frames. 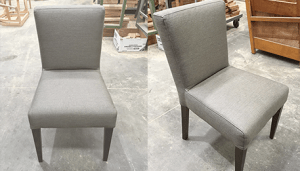 As it happens, customised dining chair frames have made a huge comeback in popularity and up-to-the-minute style. Not only are they extremely durable but they are personalized to fit your décor. Imagine finding the most beautiful dining table at an estate sale. But unfortunately the gorgeous antique came without chairs. Now finding a set to match your priceless piece is nearly impossible. You search high and low in every shop in town and even on the Internet. Now this scenario happens quite often. Sometimes a homeowner may be missing just one chair from a current dining set. But you can search the world over for a match to no avail, especially if your piece is an antique. And if you do happen to find a match, your can bet that the price will be quite costly. Custom furniture is the ideal solution when you need a certain hard to find style or you need it to fit a particular area. In truth, it will match perfectly with your décor, including style and color scheme. Additionally, having your dining chairs customised will take the stress out of trying to find a replacement or set. Customised dining chair frames have a matchless style unlike commercial type frames. They can be catered to your own personality or perhaps replicated from Old World classics. And once you have decided on a unique frame you can stylize it with the perfect upholstering fabric. What is more, the inspirational furniture is actually a work of art and will be an heirloom piece in your family for years to come. Customised furniture is built to last. They are not put together quickly with cheap materials and staples like mass-produced furniture. They are crafted with durable wood, handmade with precision and designed to fit your specifications. © Copyright 2017. All rights reserved by | » Advantages of Customised Dining Chair Peter Ross Enterprises Melbourne | Website Designed by: Netwizard Design.